No precise information on losses in stored beans by bruchids is available. However, farm storage for six months is accompanied by about 40% loss in weight with as much as 80% of the seeds being infested and unfit for human consumption. Losses vary between 7% in Colombia to 73% in Kenya. The Bruchidae are adapted to attack the mature seeds of legumes, and those which attack food legumes demonstrate a certain degree of specialization to different legume species. The larva penetrates the seed and subsequent development takes place entirely within the seed cotyledons. The larva pupates within the seed but before doing so prepares the point of its eventual escape from the seed by chewing away a circular escape tunnel through the cotyledon leaving intact only the testa at the outside. This area of undermined testa can be seen clearly as a grey ‘window’. 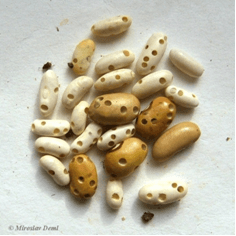 It is a widely distributed pest of storage beans. 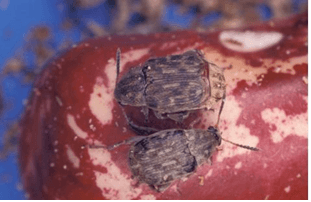 Bean weevils are generally compact and oval in shape, with small heads somewhat bent under. Sizes range to 1mm, up to 22mm for some tropical species. Colours are usually black or brown often with mottled patterns. Although their mandible may be elongate they do not have long snouts. 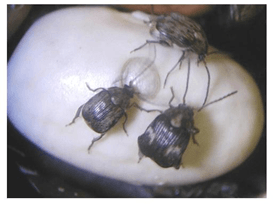 Adults deposit eggs on seeds, then the larvae chew their way into the seed. When ready to pupate, the larvae typically cut an exit hole, and then return to their feeding chamber. Adult weevils have a habit of feigning death and dropping from a plant when disturbed. Typically they infest various kinds of beans, living for most of their lives inside a single seed. Acantoscelides obtectus and Acantascelides obvelatus – develop in Phaseolus vulgaris; Acantascelides argillaceus – develop in Phaseolus lunatus. A. obtectus predominates in cooler areas. Eggs are laid on stored beans or in cracks of growing pods in the field. The larvae tunnel into the seeds to feed. Adult weevils are short-lived and do little feeding. A. obtectus is a better competitor than Zabrotes subfasciatus at lower temperatures and will eventually predominate under these conditions. 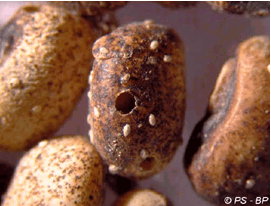 A. obtectus females do not glue eggs to the test but scatter them among stored seeds or infest beans in the field by ovipositing on growing pods. The newly hatched larvae will later penetrate the seed. A. obtectus live 14 days and lay an average of 45 eggs. Chemical control of harmful species from the Coleoprera Order is acceptable only in certain very limited situations, and unacceptable in the majority of cases for the residual toxicity. The following controls are recommended: Preventive control measures: overall cleaning measures, specific preventive measures, physical treatments; preventive measures applied when introducing the products into the storehouse; periodical supervision measures; curative, non-polluting measures (dehydration powders, means of entheroleter, means of pheromone traps, use of microwave electromagnetic generators, use of strong electric fields and “corona” discharges in alternative current, use of vegetal insecticides. Porca M, Ghizdavu I, Oltean I, Bunescu H. 2003. Control of the coleopteres in stored agricultural products by not-chemical methods. Journal of Central European Agriculture (online), 218 Volume 4 (2003) No3. Beans, cowpea and vigna unguiculata. All the known hosts of Zabrotes are in the Fabaceae with a questionable record in the Bixaceae. Cosmopolitan. It is a tropical species and is found predominantly in warmer areas. Zabrotes subfasciatus attaches the egg to the seed. After hatching, the young larvae bore through their egg shell and the seed coat in one process. Zabrotes subfasciatus does not attack in the field. Adults exhibit strong sexual dimorphism. Females are large and have four characteristic cream-coloured spots on the elytra. The male is entirely brown. At 28oC and 75%-80% r.h. Females lay an average of 36 eggs and live 13 days. The egg stage lasts five to six days, larval development takes 14 days, and the pupal stage takes six to seven days.